The basis of our routine dentistry is recognition and prevention of oral pathology through a comprehensive, sedated oral exam. We recommend every horse be examined at least once a year. In some cases, more frequent examinations and care may be recommended. The external exam evaluates your horse’s face, nose and eyes for any abnormalities. We pay close attention to facial symmetry, facial swelling, and any drainage from the eyes, nose, or skin. The oral soft tissues include the gum tissues, tongue, and hard and soft palate. Abrasions or ulcerations can be caused by sharp dental points. Removal of these points during the dental float will usually resolve these issues. Occlusion refers to the grinding function of the teeth when the jaws are brought together. Poor grinding function can often be improved by floating and balancing the mouth. 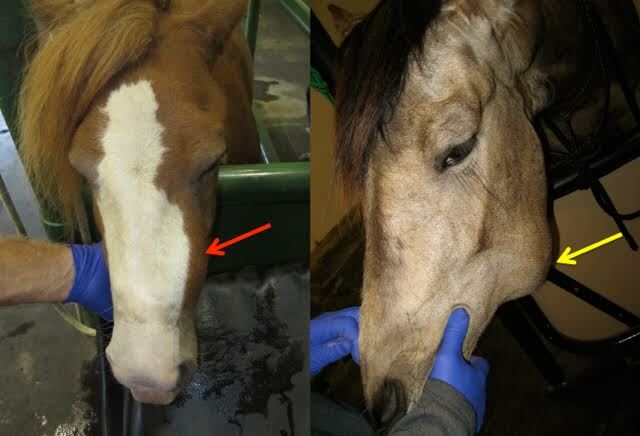 Occlusion may also be affected by the anatomy of the horse’s head. For example, an overbite or underbite may be present if the length of the lower jaw is not equal to that of the upper jaw. Periodontal status looks at the gums and other tissues surrounding the teeth. 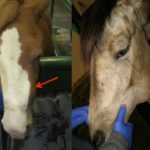 Gum disease in horses can be extremely painful. Horses’ teeth should be tightly packed together, with very little space in between neighboring teeth. If horses develop spaces (diastemata) where food can get stuck, this can lead to gum disease. Advanced gum disease will eventually lead to gum recession and bone loss, which is not reversible. Endodontic disease involves the internal structures of the tooth. The two main problems that we may find are exposed pulp chambers (decay in the sensitive part of the tooth), and infundibular caries (decay in the non-sensitive part of the tooth). Radiographs are usually recommended to formulate a treatment plan. During the exam, we carefully evaluate sharp enamel points, which horses develop through the normal eruption of their teeth. In addition, some horses have imbalances in their mouths, which may need to be adjusted to optimize chewing function. The equipment we use for examination and floating is designed to be safe and effective. Our power dental instruments have water irrigation and suction, which prevents any thermal damage and allows superior visibility and precision. The dental instrumentation that we utilize is designed to smooth the surface of the tooth without causing trauma to the soft tissues of the mouth.